Every state is required to go through redistricting after a census. The next opportunity comes in 2021. The opportunity for Democrats to enhance their prospects in races for legislative and congressional seats for an entire decade is still three years away, but they're already thinking about it in Pennsylvania. With Gov. Tom Wolf getting elected to a second term and a Democratic majority entrenched on the state Supreme Court, the party now sees itself in the best position since the 1990s to draw post-Census boundaries for seats in Congress and the state Legislature. "We're always aware of it, because we've always had bad maps," said Nancy Patton Mills, Pennsylvania's Democratic Party chairwoman. In nearly two decades on Republican-drawn maps, Pennsylvania has seen huge majorities of Republicans in its congressional delegation and in the state Legislature, even while Democrats held a sizable edge in voter registration and dominated statewide elections. To wit, Pennsylvania is among the nation's biggest contributors of Republicans to Congress and, in the nearly-ended two-year session, Republicans held their largest modern-day legislative majorities in the state Capitol. Democrats trace that Republican success back to the GOP holding the pen during the last two post-Census redrawing of districts by virtue of the party controlling all three branches of government at the right time. Republicans attribute their success to better candidates. But the coming decade will put that to the test. Democrats now expect Wolf to provide a bulwark against the GOP-controlled Legislature in 2021 when it is time to write new congressional boundaries into law, based on decade-long demographic shifts identified by the Census. Legislative district boundaries are drawn by a five-member Legislative Reapportionment Commission, and Democrats expect the party's 5-2 majority on the state Supreme Court to provide a helpful fifth appointee to give Democrats the final say. The party is substantially happy about the January decision by the court's Democratic majority to overhaul congressional districts that had been widely viewed as among the most gerrymandered in the nation. The Nov. 6 election was the first election on the new court-ordered map of congressional districts . In it, Democrats captured nine of 18 seats, ending a streak of Republicans winning 13 of 18 seats in three straight general elections on the GOP-drawn map. But Democrats maintain that the legislative district boundaries remain gerrymandered by Republicans. "I do believe that there are a number of seats purposely gerrymandered to benefit Republicans, no doubt about it," said Senate Minority Leader Jay Costa, D-Allegheny. The Legislative Reapportionment Commission consists of the Republican and Democratic floor leaders from the House and Senate and a fifth member they appoint, if they can agree on one. If they can't, and they usually don't, then the state Supreme Court members appoint the fifth panelist. 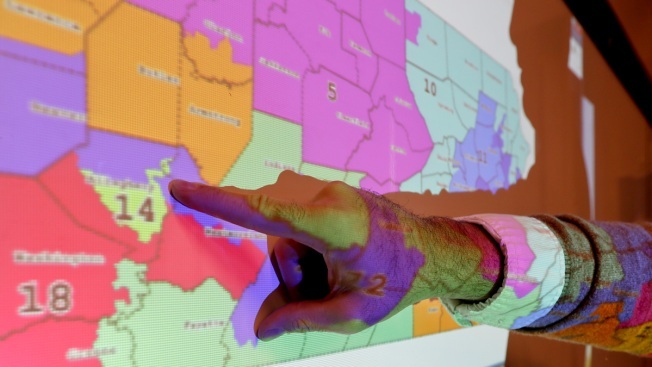 The legislative maps in 2012 won the unanimous approval of the state Supreme Court -- at the time, controlled by Republicans, 4-3 -- and Republicans point to that decision as evidence that the maps are fairly drawn, without gerrymandering. Pennsylvania's Republican Party chairman, Valentino DiGiorgio, maintains that the high court delivered a bare-knuckled partisan punch to the state's congressional districts, and said he fears its intentions when legislative districts are redrawn. "They're going to gerrymander," DiGiorgio said. "They're going to do the same thing they accuse everybody else of. ... I would fully expect a very partisan political Supreme Court to make an equally partisan decision on who the fifth member of the Legislative Reapportionment Commission will be." Perhaps the four floor leaders can agree on a fifth member who is fair, DiGiorgio said. In any case, Pennsylvania's new congressional map still appears to favor Republicans, even after the court's Democratic majority ordered it redrawn. An Associated Press analysis found that Pennsylvania's new court-ordered map, using preliminary 2018 election data, still left Republicans with statistical advantage, albeit half of the advantage Republicans enjoyed in the 2016 election on the now-invalidated map of GOP-drawn districts. For their part, Democrats insist they are interested only in fair maps, not gerrymandered maps. "When the new maps come in, and if they're not drawn against us, I think you're going to see Democratic majorities over the next decade," said David Marshall, the executive director of the Senate Democratic Campaign Committee. "Because I think, in a fair fight, we win."